Love The Garden But Hate Gardening? Consider These Low Maintenance Ideas! Gardening can be a really productive hobby. It can keep you fit, it gets you outdoors into the fresh air, and seeing things you have planted grow and blossom can be really rewarding. However, gardening isn’t for everyone. Maybe you’re a busy person and simply don’t have the hours in the day to tend to a high maintenance yard. Maybe you have a disability or condition that means you can’t get out there and do the work that needs to be done. Perhaps you simply don’t like getting your hands dirty and being out with the insects and mud- each to their own. However, just because you don’t enjoy gardening doesn’t mean you don’t want a beautiful yard. Your garden is space at your home that should really be utilised, and in the warmer months especially it’s like having an extra ‘room’ to relax and entertain in. In this instance, you need a space that’s going to be low maintenance. That’s going to be a pleasant place to spend time in but won’t require a lot of upkeep. Here are some of the changes you can make to your garden, and once they’re done you don’t need to do much to keep it nice. Every garden needs a patio area, a place to put a seating area which allows you to sit outside and make the most of the space. But there are a number of different options to consider. Patio slabs are long lasting, and with the right weed barrier down you won’t be constantly pulling up weeds. If you want an ultra low maintenance outdoor space then you could forfeit your lawn and have the whole thing paved- companies like ArizonaHardscapes.com who specialise in this will have lots of slab choices available. That way you can still add personality and make the garden look fantastic without it looking like a concrete jungle! Decking looks smart and is a good choice if you need the patio area raising up- perhaps because there’s a gap under your back door. Regular wooden decking can require a lot of upkeep, however composite is a mixture of wood and plastic fibres and doesn’t need sanding or staining and it doesn’t rot. The ideal choice for someone wanting a low maintenance yard. To enjoy the garden you really need the right furniture. While things like outdoor corner sofas and swinging chairs are popular, often you have large cushions and things that you need to take on and off which can be a hassle. Choose furniture that you can use as it is, and that can easily be covered or stored away. If you’re opting for wood, choose a wood that’s low maintenance and won’t need a lot of treating to keep it at its best. Patioproductions.com speaks about some of the best options on the market along with tips and advice about the materials to choose. Lawns are a good choice for many kinds of gardens. They’re soft, so nice for lounging on and good for kids to play on. They also bring colour to the space making it look bright and alive. However, they can be a lot of work especially during the warmer months. Throughout late spring and through to the summer you’ll more than likely need to mow your grass once a week to keep it looking tidy. During warmer weather it can turn brown, meaning you need to water it daily, plus it’s best to feed it twice a year too with the right fertilisers. Then you need to scarify the dead grass and re-sow bare areas. If you love the look of lawns but can’t commit to that kind of work (let’s face it, dragging the lawn mower from the shed, plugging in the extension lead and faffing around is a bit of a pain!) then artificial turf is the way to go. These days, there are lots of different colours and blends that look really natural. It will never grow long or turn brown, it looks smart and there’s no maintenance involved. A winner for anyone that doesn’t love gardening. If you do want to keep a natural lawn, one way to keep it in order without the hassle is to choose a robotic lawn mower. The technology has really improved in recent years and they’re fantastic for helping you keep on top of this tedious chore. Uk.pcmag.com have reviewed a few that are on the market so take a look at everything that’s out there before parting with your cash. One horrible job that homeowners find themselves having to do on a regular basis is repainting sheds, garden furniture and fences. Most types of paint do fade within a year or so and if you want to keep things looking smart then you have to commit to repainting. However, if you spend a little more on paint with weather protection and a guarantee then you save yourself hassle- ronseal.com is one of the brands offering a ten year weather protection guarantee. That way, you can go years between painting your outside wood, and it prevents you having to spend a weekend out in the heat doing it every other summer. Do your research, not all outdoor paint is created the same. You will more than likely need to spend a little more, but it can mean better value overall. Most people bring interest to the garden with colour- flower beds and borders with beautiful bright blooms. 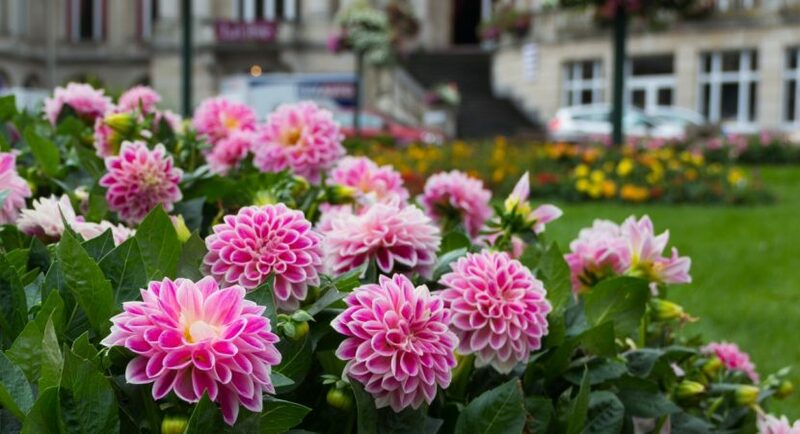 If you don’t want to spend time tending to flowers then it can cause the garden to look a little dull and bare- especially if you’ve forfeited your lawn for paving too. One way around this is by adding interest in another way. A water feature is a fantastic way to do this- it makes a statement and draws the eye but once it’s up and running there’s no messing around with it. Speaking of flowers, while watering and deadheading them can be hard work- there are other plants that you can add to the garden that are low maintenance. Slow growing shrubs won’t need a lot of trimming and cutting back, and evergreen plants will bring life to the garden all year round. Look online for low maintenance options which will bring some character to your yard without needing to spend a lot of time or money on pots, baskets and flowerbeds. If you are going to add these to flowerbeds, adding a layer of bark or chippings over the soil can prevent weeds from growing through which saves you the effort of having to pull them out every few weeks. You might be tempted to add things like statues, ornaments and other items to the garden. While these are low maintenance, they do make it more difficult to keep the yard tidy overall. Whether you’re jet washing the paving or sweeping up leaves, when you do come to do jobs outdoors it will be a lot quicker and easier without lots of things in the way. Choose a couple of pieces you love and leave it at that. If you’re really not willing to forfeit a nice lawn, flowers and a clean and tidy garden (but don’t want to do the work yourself) then you always have the option to hire a gardener. While there will be a cost involved which you’d have to work into your weekly budget, it will probably be less than you think for some basic maintenance. Have someone come in once a week over the warmer months and cut the lawn, dig the flowerbeds, pull up weeds and generally keep the place in order. Whether you want to impress family and friends at the barbeques you host or just want it looking its best for you, you can have the work done even if you don’t have the time, inclination or capability yourself! Thanks to sites like checkatrade.com it’s easy to find trusted tradespeople and check out reviews for all kinds of jobs you need doing in and around the home, so if you don’t know where to start when it comes to looking for a gardener then this could be helpful. It could be time contraints, your capability or your preference to not spend a lot of time going gardening. But don’t just give up on this area of your home, if you’re lucky enough to have outdoor space then it’s always best to utilise it. Whether you use it for entertaining loved ones or just sitting out on a dry day and relaxing, it’s a part of your home that you’ve paid to own. Have you created a low maintenance garden? What tips do you have for someone that loves their garden, but can’t (or wont!) do the work themselves?